The RTI T2X remote control by Remote Technologies Inc is the one of the flagship remotes in the RTI home automation ecosystem. It features a 2.8″ touch screen display with two-way feedback via WiFi and Zigbee along with one-way communication via 433 MHz. This device is capable of RF & IR control. It has a host of other features so let’s get into those below. This remote is an engineering marvel. 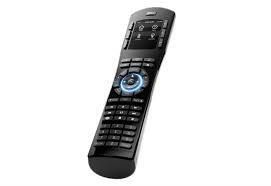 It’s a 5th generation release of RTI’s T2 remote control legacy and it puts the average universal remote to shame. The remote features 47 programmable keypad hard buttons to provide quick and easy control. Using it in the dark is easy as every button is backlit. A cursor button allows simple scrolling of lists. For example, the ability to scroll through a list of all your music to find that perfect song you want to play. It also features a 2.8″ fully customizable touch screen. It offers the best of both worlds in intuitive control, both hard buttons and a touch screen. It has features like Dual RF transmission, Grip Sensors, IR, WiFi, and more. It also has a built-in speaker so you can hear confirmation sounds when a button is pressed. 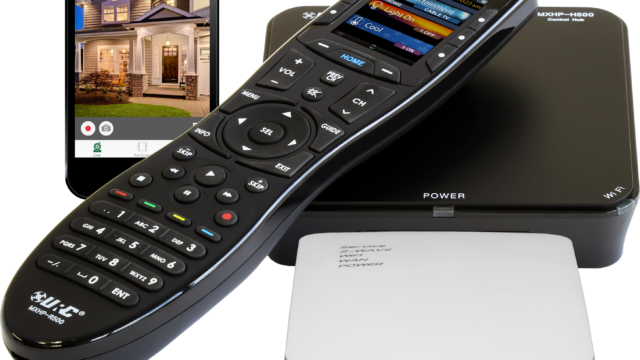 This remote is capable of controlling devices throughout your home or commercial environment. Not only is it great for a single room, but it can also scale to control the entire home. Plus it is thinner, sleeker and more ergonomic then prior versions of T2 remotes. Now that you know a little about it, let’s break down the technical nitty gritty. The T2X features a flush-mount edge to edge 2.8″ touch screen. It also supports swipe gesture control, so it makes it user friendly and easy to navigate just like a smart phone. The screen has adjustable backlighting and can auto-adapt brightness level to the environment with a built in ambient light sensor. The graphical user interface (GUI) is completely customizable. 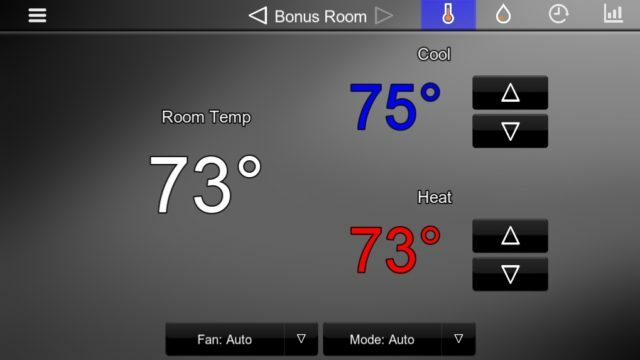 Your home technology professional can change the look of the interface to meet your desires. The resolution of the display is 240×320 with 64k colors. The T2X has an integrated grip sensor running up and down the body of the remote control. This slick feature allows the remote control’s backlighting and touch screen display to instantly wake during use and instantly turn off when not in use. So no hunting in the dark for a special backlight button so you can use your remote. Just pick up the remote and you are all set. The RTI T2X also has a built in accelerometer for instant-on backlighting as well. Your integrator can select whichever option you prefer. This accelerometer has a second function; it allows for gesture control. For example, you can flick the remote to the right to fast forward and flick it left to rewind. This adds to the user experience and makes interaction even simpler for the end user. The T2X has three wireless modes built-in (RF, Zigbee and WiFi). RF is dual transmission capable, both 433MHz and 2.4GHz Zigbee technology. It also has integrated 802.11b/g wireless Ethernet in the 2.4 GHz range. The T2X is not limited to RF communication. It also has an extremely wide IR transmitting frequency range and it can transmit both IR and RF on a single button press. Thats all fine and dandy but in layman what does all this mean? It means the remote is capable of utilizing all of the cutting edge communication technologies. What does it means for you? You get a powerful remote that can do cool things like show you animated weather map, show you what your thermostat is set to and allow you to change it right from the remote. Change the thermostat on the wall and you’ll see it change on the remote as well. This is called two way control and feedback which I will discuss next. Let’s say you have 6 zones of speakers in the ceiling of your home. With a quick glance on the touch screen you could easily see which rooms are currently playing music. Vivid room icons come to life and illuminate green to depict on. When watching a program on your satellite or cable tv provider, the name of that program can scroll across the remote control’s screen. Curious what surround mode your receiver is in? 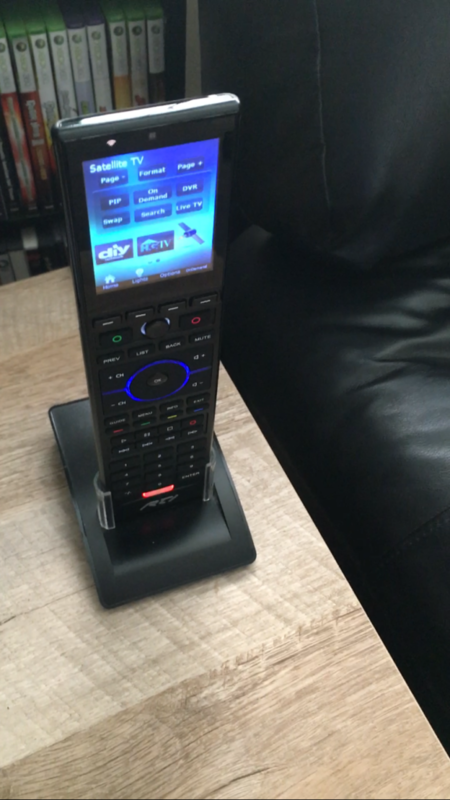 The GUI on the remote can be designed to show a 3d button with surround format name like “Dolby Atmos” that looks depressed and selected. View the local weather forecast. Select one of your favorite pandora radio stations from a scrolling list and give that song you love a thumbs up and that song you hate a thumbs down. With the newly redesigned docking station, the T2X remote now features greatly improved power management and battery charging compared to its predecessors. The remote includes a Lithium-Ion battery for long battery life. Non-volatile Flash memory stores your system configuration even when power is not present. What does that mean in layman’s terms? When the battery goes dead everything is still saved. No worries about losing that awesome control interface or any programming. The dock itself is attractive and only takes up a small footprint. 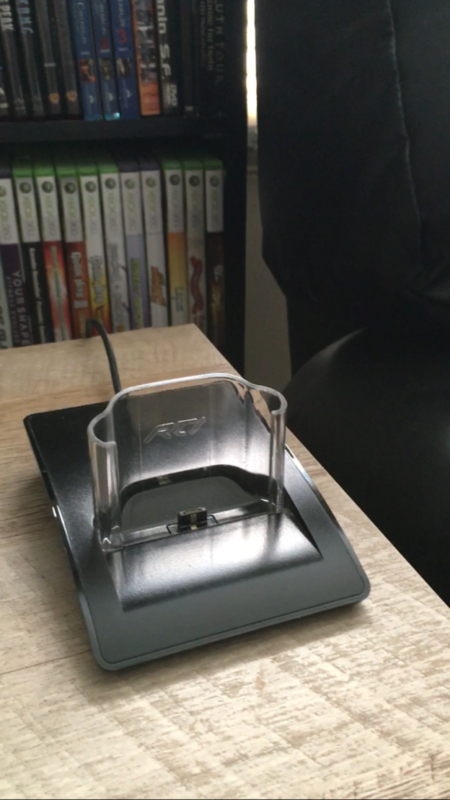 When the remote is placed in the dock an led will light on the remote indicating charging status. Red will indicate it is charging and when lit green…well your fully charged then. This remote also features the ability to have programming updated remotely by the installer. These offsite upgrades can save you and your installer time. It might also save you some money not having to call your installer out if you want minor changes done to the programming on the remote. Now that i’ve laid out all the technical mumbo jumbo, what kind of cool things can we really do with this remote and how can I see it in action? Part I mainly discussed the technical aspects of the RTI T2X remote control. In this second part I’d like to show you the exciting control this remote can offer you, particularly in a home theater. In the videos shown here, you will see a good overview of what can be accomplished with an RTI T2x programmed with two-way control. You will see actual feedback on remote being sent from the RTI XP3 processor. You will see scenes and also a lot of macros programmed into the remote. Let’s dive deeper into this remote and get you more familiar terms such as scenes and macros and show you the T2X remote controls true potential. I talked a little bit about two-way control in Part I, but here you will get to see it in action. In the particular installation shown in the video clips, we are controlling a single room with the remote. It is a theater room the client had in his finished basement. This was a retrofit job, not a new installation and the client needed a good solution to control the theater. The work done by his prior installer just wasn’t cutting it. So enter RTI’s T2X along with an RTI XP3 control processor for two-way control. Being that the videos show control of only the theater, not a whole house, it is just a small glimpse of what is possible with an RTI T2X remote when used with an RTI processorYet I think you will find that it is pretty impressive what is possible in just a single room. Part I also discussed how the remote can support IR, Dual RF, and WiFi. So what are we using here? Well in a way all three. Let me explain. Remember, IR control is strictly one-way. So IR output from the remote is not used in this installation. It just simply wouldn’t work. I needed RF control because the components aren’t in the line of sight of the remote. I couldn’t just point it at the devices I was controlling. You see, all the components are hidden underneath the basement stairs inside a closet. This includes the cable box, the surround sound receiver, a blu-ray player, a Roku player, a Lutron Caseta Smart Bridge Pro 2 that controls lights, RTI XP3 and a WiFi extender. I also wanted that valuable feedback and reliable control that two-way provides. So two-way control was absolutely critical therefor I needed to pick a processor for the remote to talk to. Since we were only controlling a single room, an RTI XP3 processor with built in Zigbee and ethernet (for two-way) was a perfect choice for the task at hand. As mentioned in detail in Part I, the T2X remote also 2.4 GHz Zigbee and Wifi to talk to the processor. So these two devices will talk to each other beautifully and get the job done. But there’s more to the puzzle. Next it was onto choosing components. To get things to talk to the RTI control system I needed devices that had what is called “two-way drivers” available, along with ethernet ports. This made two-way control and feedback a much easier task. You see the driver is a piece of software loaded onto the RTI processor which allows communication between the processor and the third party component device. This communication takes place via ethernet or rs232 (depending on the driver) hence the need for devices with ethernet ports. Still following me? Ok, now if you recall I mentioned we aren’t using IR from the remote in this installation but that doesn’t mean we aren’t using IR at all. We actually are using IR control from the RTI XP3 processor to the cable box. You see no two-way driver was available. So IR control was my only option plus two-way feedback wasn’t really critical for the cable box, so IR works perfectly and reliably. So why IR from the processor not the remote? Well again, the components are hidden away. So unless you want to walk to the closet every time you wanted to change a channel we have to use RF from the remote to the processor. RF doesn’t require line of sight like infrared does. RF can pass a signal right through walls of your home which allows me to install the RTI processor in the same closet as the components. I then run a short IR cable from the processor to the cable box. What does all this techno gibberish mean? It means when you press channel up, the remote sends that command over RF to the processor, the processor interprets it, then sends that specific channel up IR code to the cable box and viola, Magic! The channel changes. So what two-way feedback does this installation have? Well let’s walk you through some examples! 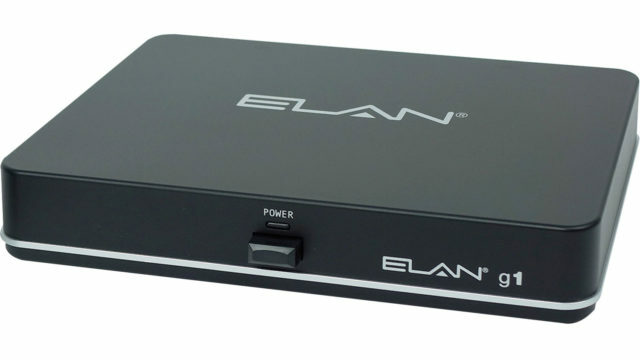 The cable box, surround sound and blu-ray all send feedback on their current power on or off state. Knowing power state is critical to control that works properly. You don’t want to press on and have a TV turn off. That’s not good. Now if you’re slick you’ll say to yourself… Well he said the cable box was IR (which is one-way) so how in the heck does the control system know when the cable box is on or off? Well we use a separate power sensing device that hooks to the processor for this task. The surround sound and blu-ray drivers allow all kinds of feedback. Not just power on/off status but things like surround mode currently in use, what input is selected, what radio station is currently selected, what chapter in your movie your currently on and more. 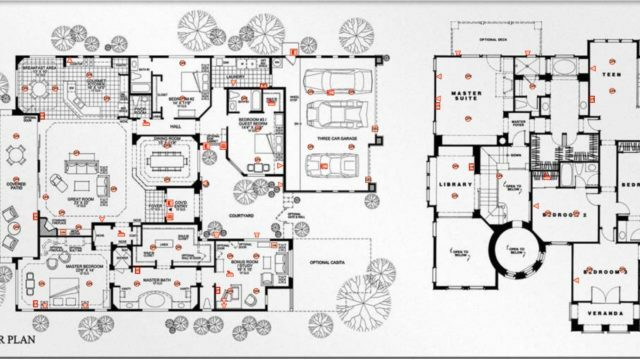 The Lutron lighting controller will send feedback as to what lights are on or off and what level they are set to. It will show what “scenes” are selected (more on that in a bit). The weather driver loaded on the processor can show you the forecast, current weather and temp along with radar images and animations. The Roku player can show a list of channels you have added and show scrolling lists. 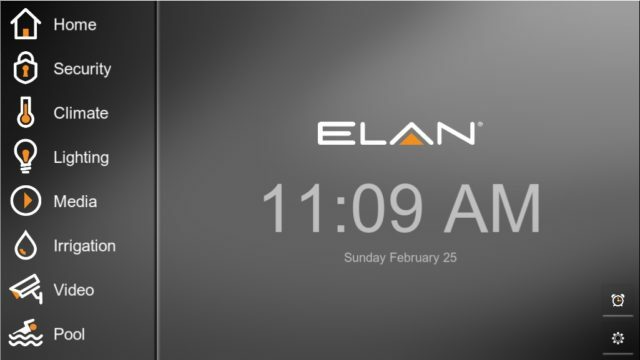 The clock driver can show you the current time right on the remote and allow you to setup “events” that run at certain times. Like having your Lutron controlled lights come on automatically at dark. What exactly are these macros and scenes that I mention? Macros are essential a set of commands that can run on a single button press or behind the scenes with no interaction required at all. These macros are a step-by-step set of commands which can control a variety of different devices. Macros allow for a much easier way of controlling things for an end user. For example, want to watch your satellite TV? Simply press the Watch Satellite TV button. The macro programmed to that button will send the commands. It can test to see if the TV is already on, if it isn’t well then turn it on. Is the receiver on? Ok good. No need to power it on then. Is the source SAT/CBL already selected on the receiver? No? Ok, well we better switch inputs then. One that automatically runs your pool pump twice a day for 2 hours at a time. Or how about watering the lawn? The macro can check to see if it has rained lately. If it has, well then no need to water. Say it determines it hasn’t rained the last couple of days. Well then it can automatically fire up the sprinklers 1 hour after sunset. Or maybe you’d like to have your bathroom and hallway lights turn on to about 10% brightness early in the am when you wake up for work. I mean you don’t want those lights super bright when you first wake do you? As you get ready over the next half hour the lights can slowly raise up to 50% brightness. Your coffee pot can turn on at 7:15 am all by itself so when you walk into the kitchen your coffee is made and nice and warm. You can do some really cool and wild things with macros. Only limited by the imagination (and budget of course)! Scenes are much like a macro. Basically a button press that allows you to change the environment around you to a certain preset. Why would you use a scene? Well for convenience. Scenes are commonly used in conjunction with lighting control. You can control an entire group of light fixtures from one single press on your remote and evoke a certain mood. For example, you could have a button labeled party which set the lights in your kitchen and living room area to 30% brightness. It can also simultaneously turn on the hot tub jets and tell the kitchen, living room and patio zones to play country music from Pandora. Or how about a goodnight or welcome home scene? Hop in bed and with one press and all the lights turn off throughout your entire home, your garage door closes and your doors lock. Or arrive home, hit a single button on an RTI touch screen keypad in the garage and walk into a house that is illuminated for both your safety and convenience. Those are just a small sample of the cool kinds of things that are possible with scenes. So now you should have a good summary of what an RTI T2X remote control can do. It really is a great product but it is just a small sample of the products offered by RTI. Stay tuned for more posts and thank you for reading!